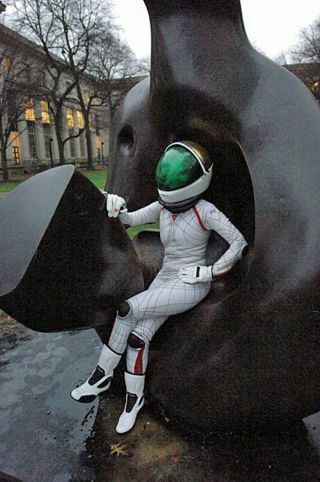 Dava Newman dons the Biosuit spacesuit design on Henry Moore's sculpture "Reclining Figure" on the MIT campus. For astronauts flying in space, spacesuits are a must-have accessory. But spacesuit technology has come a long way since the dawn of human spaceflight. Tonight, MIT professor Dava Newman will discuss her BioSuit spacesuit design and you can watch it live online. Newman will discuss her BioSuit spacesuit concept at 7:30 p.m. EDT (2330 GMT) during a live webcast hosted by the Harvard-Smithsonian Center for Astrophysics (CfA) in Cambridge, Mass. You can watch the BioSuit webcast live on Space.com, as well as directly from the CfA here: http://www.cfa.harvard.edu/publicevents. Newman is the director of MIT's Technology and Policy Program, and serves as a professor of aeronautics and astronautics and engineering systems. Newman's Biosuit discussion tonight is part of the monthly Observatory Nights program at the Harvard-Smithsonian Center for Astrophysics. The lecture series was founded in 1930 by then CfA-director Harlow Shapley to share the latest discoveries by astronomers with the public, according to an event description. Email Tariq Malik at tmalik@space.com or follow him @tariqjmalik and Google+. Follow us @Spacedotcom, Facebook and Google+.